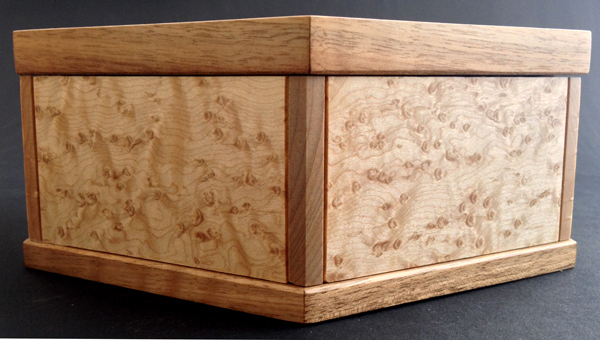 This box is an evolution of the Pattern Box, Cafe Wall Table, and Lotus Table and has been many years in the making. 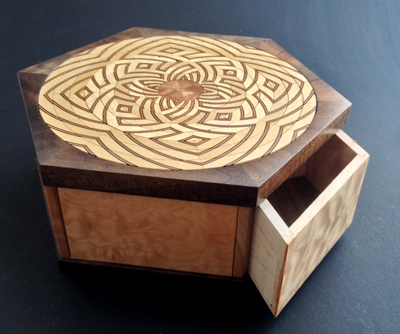 Eight rings rotate on the top of the Lotus Box and generate many different beautiful patterns, some very recognizable. Hidden about the box are clues to building special patterns. Should you successfully recreate one of these by rotating the rings, one of four compartments will be unlocked. The first clue will lead you on a treasure hunt for the others and eventually you can unlock the final compartment. The Lotus Box is the first of three boxes. If this and the second box (Caterpillar Box) is solved and combined you will see a clue for opening the third box (Butterfly Box). 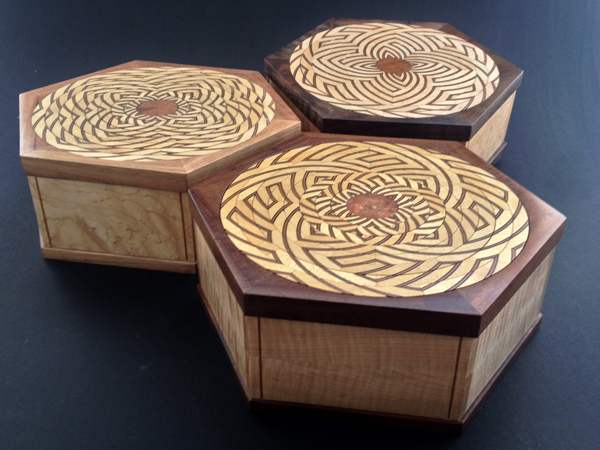 In each box the set of rings generate entirely different patterns. The Lotus Trilogy. 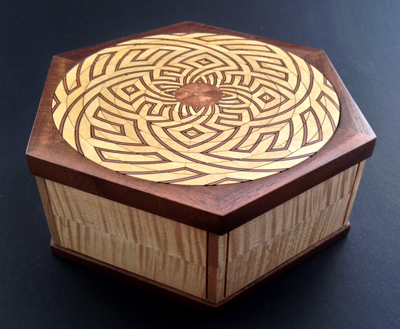 (The proper ring patterns for the Caterpillar Box and Butterfly Box are not displayed here). These tiny stripes on the top of the box are composed of Wenge (dark pinstripe) and Madrone (pink). 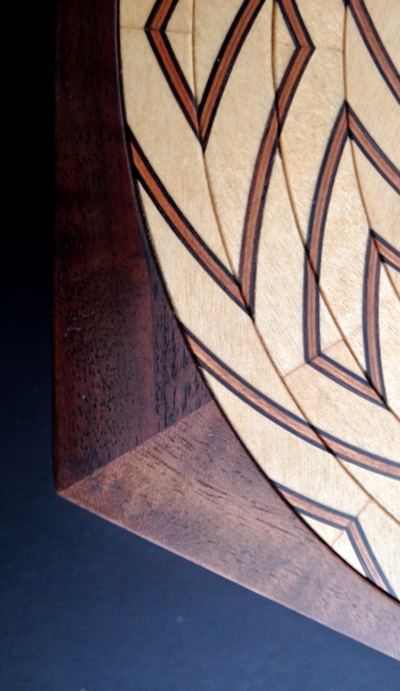 Each stripe is composed of 4 layers of veneer pressed into a logarithmic curve and inset into the ring. 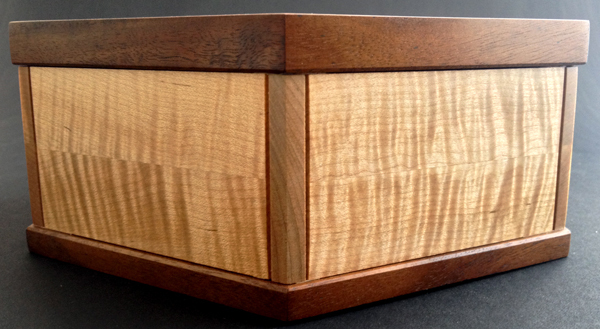 Walnut and Maple are two of my favorite woods because these have an amazing large variety of figures and color tones. 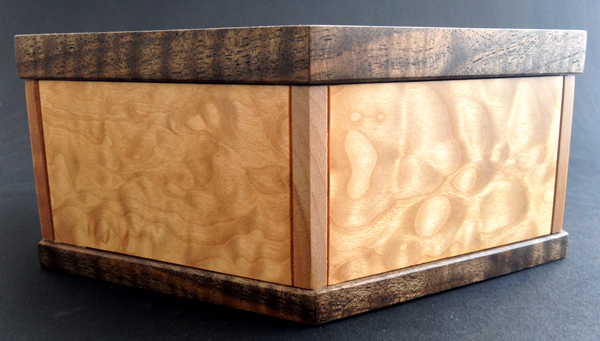 Each box in the Lotus Trilogy is composed of a different type of Walnut and Maple. Claro Walnut and Curly Maple for the Lotus Box, European Walnut and Birdseye Maple for the Caterpillar Box, and Bastogne Walnut and Quilted Maple for the Butterfly Box. Bastogne Walnut is actually a cross pollination of European and Claro Walnut! Click here to learn more about these woods.